The Medieval Times show in Lyndhurst, New Jersey. Slate produces a fun podcast called Working, in which people explain what it’s like to do their jobs. If you’re into this kind of thing, you’ve read Studs Terkel, right? 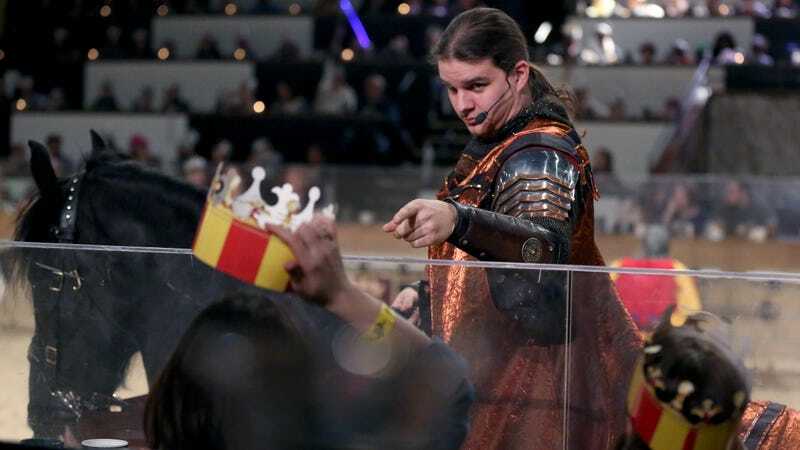 Anyway, you won’t find Medieval Times in Studs Terkel’s books, but it is the subject of the latest Working podcast, in which the host speaks with Toni Ann Siri, bar manager at the Medieval Times in Lyndhurst, New Jersey. This was an especially fun listen for me, because I attended that very Medieval Times with my high-school church youth group. Alas, no drinks were served. Siri talks about her 16-year career at this particular Medieval Times, where she worked her way up from “wench”—an official job title—to running the whole bar. The bar, she reveals, makes “a pretty penny” for the entertainment company, because “especially in Jersey, they love to drink.” Siri reveals what it’s like to work New Year’s Eve at Medieval Times, the perhaps surprising opportunities for career advancement, and what’s inside the Dragon Slayer cocktail. If only more jobs involved jousting.